It's March. That means nothing but net (and maybe a little work in between). 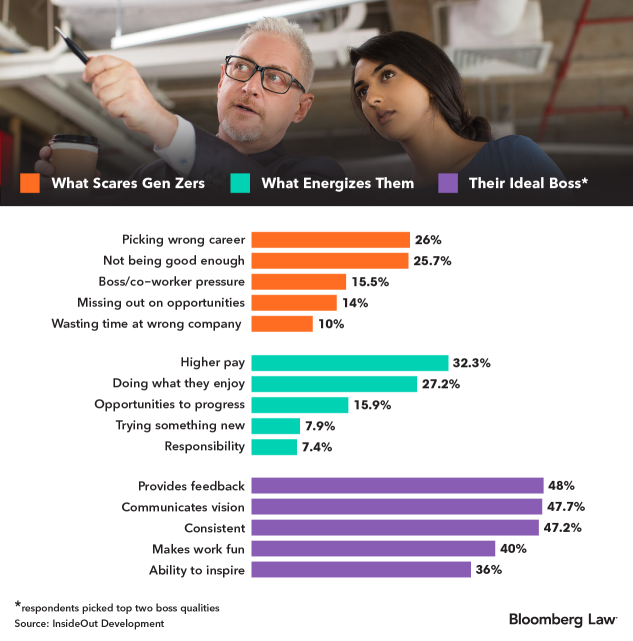 The best way to turn off an insecure, smart, competitive, funny Gen Z employee is to manage through fear, according to a just-out report on this “new and different breed of worker.” They may look like millennials, but there are lots of differences. About 11,000 Gen Zers are entering the workforce every day. That and more in this week’s “HR Buzz,” featuring the latest workplace trends, surveys, and reports. What do Gen Z, post-millennials, the iGeneration, and the digital native generation have in common? Everything. These are just different names for the people born from 1996 to 2010, who started entering the workforce in 2017. That’s the word from workplace coaching company InsideOut Development, which just surveyed 1,125 of these new kids on the block. They’re indecisive, open, diverse (more than any other generation), idealistic but not at the expense of job security, and want to get ahead, the company says in a new report. They want loyalty from an employer but it’s not certain whether that is a two-way street. Gen Zers can have a dark sense of humor. They value training and coaching, especially in soft skills, and will seek them out. Gen Zers grew up in the shadow of the Great Recession of 2007-2009, which has colored their outlook and instilled a need for financial security, InsideOut CEO Bill Bennett told Bloomberg Law. They’re not just junior millennials. While Gen Zers tend to be indecisive, millennials “assume they know the right way forward,” whether or not they do, he said. Despite their insecurities, the post-millennials are also entrepreneurially minded, the survey found. To keep them as employees, companies should stimulate “their natural creativity” by “focusing on innovation—not just financial performance,” InsideOut advises in the report. Gen Z is “more comfortable calling out workplace discrimination” than any past generation, and almost half consider themselves minorities, according to the report. That’s one reason the data point that most surprised Bennett was that 64 percent of respondents said they would accept a position even if the levels of diversity and inclusion weren’t ideal. “That’s not a lessening of emphasis on diversity, it’s an increase in concern about job stability,” he said. Michael Rutkowski, InsideOut’s marketing vice president, said he saw a dark humor in some of the anecdotes respondents shared. One included a tongue-in-cheek reflection on his family’s financial struggles. They lost their jobs and home and even their cars, and had to rely on others for help. He expressed it with wit and “and an understanding that things can be fleeting,” Rutkowski observed. Millennials were a lot more likely to ask for help than previous generations, but “Gen Z carried it a little further,” Bennett said. “They want to be trained and coached independently and learn how to watch out for the potholes,” he said. Sixty-eight teams, 67 games, 19 days. You know the drill. March Madness begins with a St. Patrick’s Day Selection Sunday (the ultimate beer feast). The end of the road—April 8. It’s hard to say which stirs more excitement—guessing who’ll take the championship or predicting how much time employees will spend streaming games and eating basketball-shaped cupcakes at work. But the message this year seems to be embrace the madness. Almost three-quarters (72 percent) of managers told Robert Half that the playoff activities boost morale at the office, and a full three-quarters of employers organize celebrations of some sort. And when spirits are high, productivity often comes along for the ride, according to a report from the staffing firm. Over half (52 percent) of respondents said they see productivity benefits to the activities. Biggest morale boosts were anticipated by bosses in Des Moines, Iowa, and Indianapolis (tied), Raleigh, N.C., and in third place, Dallas, Detroit, and Salt Lake City. “Employees just need to remember to play by the rules. Make sure completing assignments remains the top priority by staying within company guidelines and celebrating in moderation,” Naznitsky said. The coach would agree: productivity and leadership coach Ellen Faye, that is. “One of the most important characteristics of an effective team and motivators is relatedness/sense of belonging/connectedness. When people feel connected at work they stay, they are happy and they produce more,” Faye said. “If work quality is seriously compromised, then I suppose that a manager could set some ground rules—like you can talk about it the first hour in the office, but then we have to focus on our work. My guess is that the spirit of connectedness provides more benefits than the bit of work that isn’t getting done,” she said. And just in under the buzzer for this week’s column is personal finance website WalletHub’s annual Best Cities for College Basketball Fans report, including tips on how to be a good fan. Top three cities, WalletHub says: Lawrence, Kan., Durham, N.C., and Los Angeles.